A woman may be the power behind a man, but she is not allowed to take power for herself. This book is the story of two women, one an Empress and one who was Queen of England and begins in 1125. Matilda, married off at a young age is summoned home from Germany after the death of her husband the Emperor. Old king Henry may have plenty of bastards, but Matilda is his only legitimate heir and Henry wants her married well and to someone who can sire sons. Much to Matilda’s displeasure, he picks the very young Geoffrey la Bel, Count of Anjou, but duty and honor always come first and they do well enough with each other despite a very rocky start. 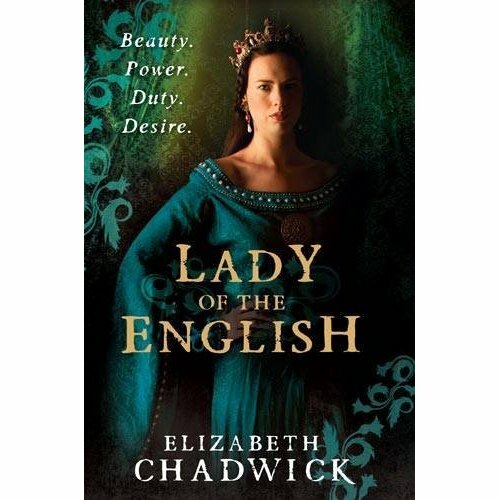 The second woman in the book is Adeliza of Louvain, king Henry’s second wife, who is apparently unable to conceive the much-needed male heir. Matilda and Adeliza are close in age, and become good friends, but that relationship is sorely tried after the death of the old king when Stephen of Blois is conveniently poised and ready to steal Matilda’s crown. The barons are most unwilling to let a woman rule them, but Matilda is not about to give up and she’s aided by half-brother Robert of Gloucester and Brian Fitzcount. Adeliza is now married to William d’Aubigny who is loyal King Stephen, and while she sympathizes with Matilda’s cause, her duty and honor to her husband comes first – and those conflicting loyalties and how it reflects the friendship between the two women are very much what this novel is about, along with the impact a long and bloody civil war has on the countryside and the people. This is a complicated piece of history with many players, but I loved keeping the main focus on the relationship between Matilda and Adeliza and found it a very effective way of showing the reader a different side of Matilda, who had a reputation for being a bit of a termagant. Adeliza’s devotion to the church and her charities was also an excellent way to show the more human aspects of the conflict and the great toll it took on the country. I very much enjoyed watching Matilda’s relationship with her son and heir, especially after his *invasion* of England at fourteen. 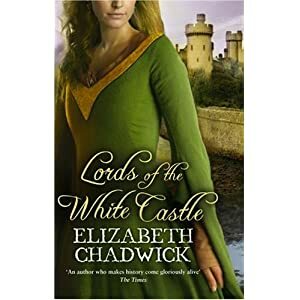 As with all of her novels, Chadwick excels at bringing the medieval period to life – prepare to let yourself be sucked into another century for the weekend. Thumbs up on the author’s notes at the end where she tells us what is fact and what has been surmised. Lastly, a very big thumbs up for staying true to her character’s devotion to God, honor and duty and not succumbing to the temptation of throwing in an affair that never happened just to spice up one’s book. Five stars. Many thanks to Little and Brown for my copy. Set in the 12C, Alexander de Montroi, unwanted by his older half-brother, is placed in a monastery where he was abused by a monk. Alexander escapes the monastery and seeks his half brother Hervi who is a tourney knight in partnership with Arnaud de Cerizay and his wife Clemence and their daughter Monday. As Alexander is trained by his brother to be a tourney knight, he also earns the lifetime enmity of fellow tourney knight and all-around bad guy Eudo le Boucher. Eventually, Monday’s mother dies in childbirth and her father is driven mad with grief and is killed by le Boucher, leaving Monday in the care of Hervi and Alexander. One night Monday and Alexander get a bit too tipsy and end up in bed together, leading Monday to leave the protection of the de Montroi brothers and seek employment with Lady Elise as a sempstress — and finds herself pregnant. Hervi is injured and Alexander leaves him in care of monks (good ones) as he searches for Monday to no avail. The brothers fear she is lost to them forever. John, Count of Mortaine, visits the castle where Monday resides and is smitten and makes her his mistress as Alexander, with no hope of finding Monday, takes service with William Marshal as a household knight. After several years, their paths cross and the rest of the story then revolves around extricating Monday from John’s clutches along with those of Monday’s well born grandfather – who now needs an heir and wishes to have Monday married to someone more suitable than Alexander – but Alexander must be put out of the way first. 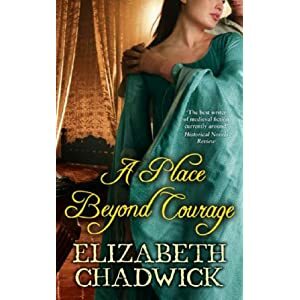 This is one of Chadwick’s earlier novels and while her attention to historical detail is outstanding as always, this book does have more of a romance feel to it, although I thoroughly enjoyed Alexander and Monday’s love story. King John is delightfully evil as always as are the other baddies leading up to an exciting ending waiting to see if true love will win out in the end. 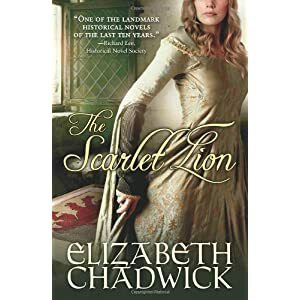 While not her best novel, Chadwick’s second best is head and heels above much of the rest in the genre, and as always the way she brings the medieval period to life with the smells, clothes, food and battles is just awesome. Unputdownable! Is that a word? If not it should be, at least when describing this author’s books. 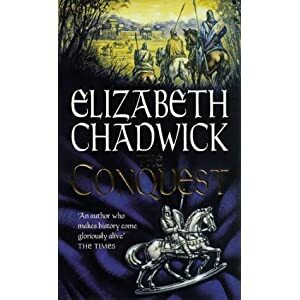 The Conquest is really two books in one, telling the story of two generations as it opens shortly before the Norman invasion of 1066. Saxon housewife Ailith loses her husband, brothers and new born child and attempts to take her own life, but is stopped by womanizing Norman knight Rolf de Brize. To avoid the romantic attentions of a London Goldsmith, Ailith accepts Rolf’s offer to serve as chatelaine at his castle and (of course) love follows and they have a daughter Julitta. Eventually the relationship deteriorates, not helped by the fact that Rolf has a wife and daughter in Normandy. The second half of the book tells the story of their daughter Julitta, reunited with her father after years of separation and she has to see her beloved Benedict marry her half sister who loves the church more than she loves her husband. Caught up in the revelries of a May Day celebration the actions of Julitta and Benedict have far reaching consequences on everyone’s lives and……. I’m not telling anymore, you have to read for yourself. Needless to say that once I picked the book up (and this is the second time around) I just could not put it down, and as with all of this author’s books the way she brings the medieval period to life in such a graceful and effortless way, be it the sights, sounds, smells, food, clothes and battles is just awesome. Although her books are becoming rare and hard to find in the US they are readily available through UK and Canada and well worth the cost and effort to do so. Five stars. While serving as a squire at the court of Henry II, fifteen year old Fulke FitzWarin runs afoul of a drunken Prince John and fights back when John attacks him with a wooden chess board, leaving a grudge that both men carry into adulthood. The FitzWarin family fights to have Whittingdon Castle, that was taken from them during the Civil War, returned to them, yet upon Richard I’s death the now King John refuses to consider Fulke’s plea out of spite. Fulke and his brothers rebel against John and become outlaws, living in the woods and robbing whenever they can from John (hmmm, a bit similar to a certain legend?). Fulke has carried a torch for Maud Walter, who was married to a much older Theobald Walter when she was very young. Recently widowed, and at risk of being married off to one of John’s henchmen, Fulke literally whisks her out from under John’s nose and marries her and she joins Fulke and his brothers as outlaws as they continue to fight to regain Whittingdon Castle. There’s a whole lot more to the story than that, but as usual I’m not into book reports, read it for yourself. 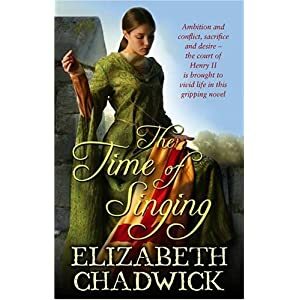 As always with Chadwick’s books, the way she brings the medieval period to life in such a graceful and effortless way, be it the sights, sounds, smells, food, clothes and battles is just awesome. As quoted on some of her book jackets, the next best thing to time travel. 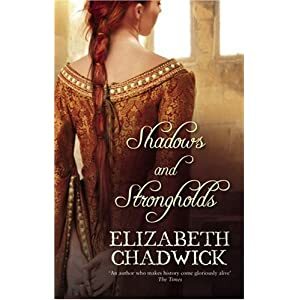 Chadwick has also written a prequel of sorts telling the story of Fulke’s parents, Shadows and Strongholds that I also highly recommend. Chadwick never fails to deliver! 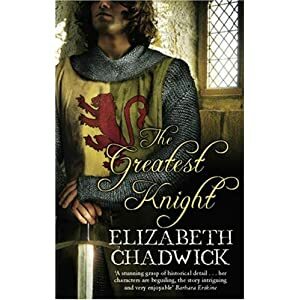 This is a prequel of sorts to The Greatest Knight, and is the story of John FitzGilbert, the father of William Marshal. The story takes place amidst the backdrop of England’s civil war between Henry’s daughter Matilda and her cousin Stephen who usurped her crown, as John tries to juggle his perilous position between the two rivals for the crown. John’s first marriage to Aline (the best he could make at the time in his position) does not fare well as she is weak of mind as well as spirit, and when he chooses to side with Matilda he makes a more advantageous marriage with Sybilla, who bears John several children including William. The characterization of John started from a cat that always lands on his feet to a loving husband and father, facing the most difficult decision of his life. The author did a marvelous job of bringing John, Aline and Sybilla to life, and most especially young William. I was totally entranced at the way William was portrayed, from his exuberant first word to his innocent knowledge of the danger he was in whilst being held hostage by King Stephen. While this is not a page turning, sit on the edge of your seat, action filled novel, I was thoroughly entertained throughout. 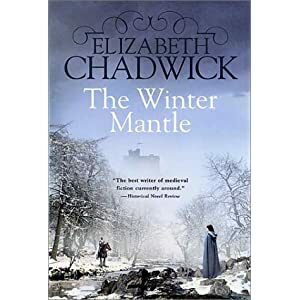 As always with Chadwick’s books, the way she brings the medieval period to life in such a graceful and effortless way, be it the sights, sounds, smells, food, clothes and battles is just awesome. As quoted on some of her book jackets, the next best thing to time travel. Five stars. A wonderful coming of age story. This book is the story of Fulke “Brunin” Fitzwarin, taking him from childhood to his manhood. As a young boy, Brunin withdraws into himself to avoid the pain from his domineering overbearing grandmother, and his father sends him to train as a squire to Joscelin de Dinan. As Brunin blossoms under Joscelin’s care, he eventually becomes a strong young man and a knight to be reckoned with, and he learns to deal with the shadows of his youth and banish them forever. Brunin and Joselin’s daughter Hawise began as childhood friends growing up together, to becoming man and wife, while trouble and conspiracies threaten their happiness. 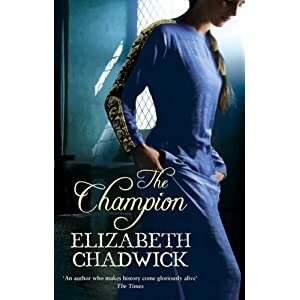 As always with Chadwick’s books, the way she brings the medieval period to life in such a graceful and effortless way, be it the sights, sounds, smells, food, clothes and battles is just awesome. As quoted on some of her book jackets, the next best thing to time travel. Five stars.